Photo Booth for wedding receptions, parties and events. Party Photo Booth hire in Leeds for wedding receptions, parties and events in Leeds, York, Bradford, Harrogate, Wakefield, Barnsley, Castleford, Pontefract, Dewsbury, Halifax, York, Huddersfield, Sheffield, Yorkshire and surrounding areas. Wedding Photo Booth hire in Leeds for wedding receptions, parties and events in Leeds, York, Bradford, Harrogate, Wakefield, Barnsley, Castleford, Pontefract, Dewsbury, Halifax, York, Huddersfield, Sheffield, Yorkshire and surrounding areas. A photo booth is a great entertainment at Weddings and parties providing you and your guests a lasting memento. Fancy dress and funky accessories included with your booking will include hats, masks, moustaches, wigs, inflatable guitars, funky glasses and much more. These can be provided to any theme if requested. Our photobooth booking includes video messaging at no extra cost. Our party photobooth provides unlimited instant prints and video messages using high quality cameras, professional lighting, a touch screen monitor and a box of props including hats, moustaches, wigs, inflatable guitars and much, much more. Anything from the wild west to magical east. An attendant will ensure the smooth running of your wedding, party or event. Available for Proms Weddings Parties Engagements Anniversaries Birthdays and Corporate Events. Branded booths and backdrops are available for corporate events. As well as personalised photo booth strips at each event a range of online and full size prints are provided for every booking. Wedding and Birthday Guest Books available. From our regional depots in Leeds, Manchester and Nottingham we are easily able to travel to parties in Yorkshire, Lancashire, Lincolnshire, Cheshire, Derbyshire, Nottingham and most of the north of England. Located in York to Harrogate, from Bradford and Halifax to Huddersfield and from Wakefield to Barnsley and beyond. 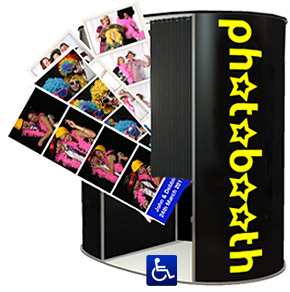 Based in the North of England we provide photo booth hire nationwide. Wind Machine, Guest Book and Double Picture strips are included in our hire price.